This is the first non-fishy French Friday of June. Boy ! am I glad ! So the Doristas picked Guacamole for this Friday. Though a Mexican dip, Guacamole has apparently become a standard in France. Dorie says that in chic restaurants there, they serve it in tartines dotted with shrimps, as the base for salmon tartare, in layered crab salads or even as a garnish on gazpacho. I have already tried the 'crab avocado ravioli' and avocado with salmon in a different recipe and can image how good those French dishes with guacamole must be. Dorie says that for most of their dishes, the French buy the guacamole, but she likes to make her own. She makes it two ways, chunky and smooth. For the chunky version, she mixes lime zest, chopped cilantro leaves, slices of red onion, jalapeno and salt with a fork. 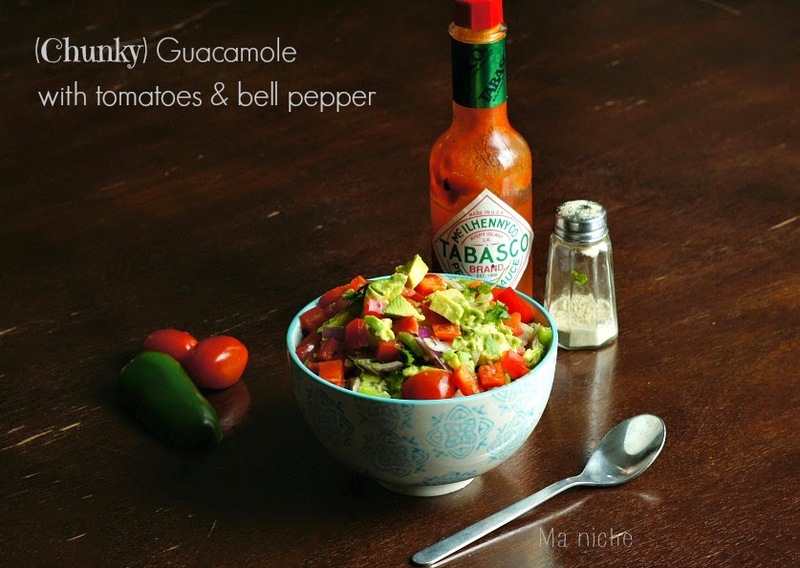 Then adds chunks of avocado, chopped red bell pepper and cherry tomatoes to it. Squeezes some lime juice over it before seasoning the mixture with salt, pepper and some hot sauce and finishing with a garnish of cilantro leaves. For the smooth, she uses the same ingredients but blends them using a mortar and pestle. For want of a mortar and pestle I went for the chunky version and served it with chili and slices beer bread. The Guacomole and the combination as a whole was such a hit that the whole bowl was wiped clean over dinner that night. This recipe will certainly be a repeat in our house. Visit French Fridays with Dorie to know what the other members thought about this spread. 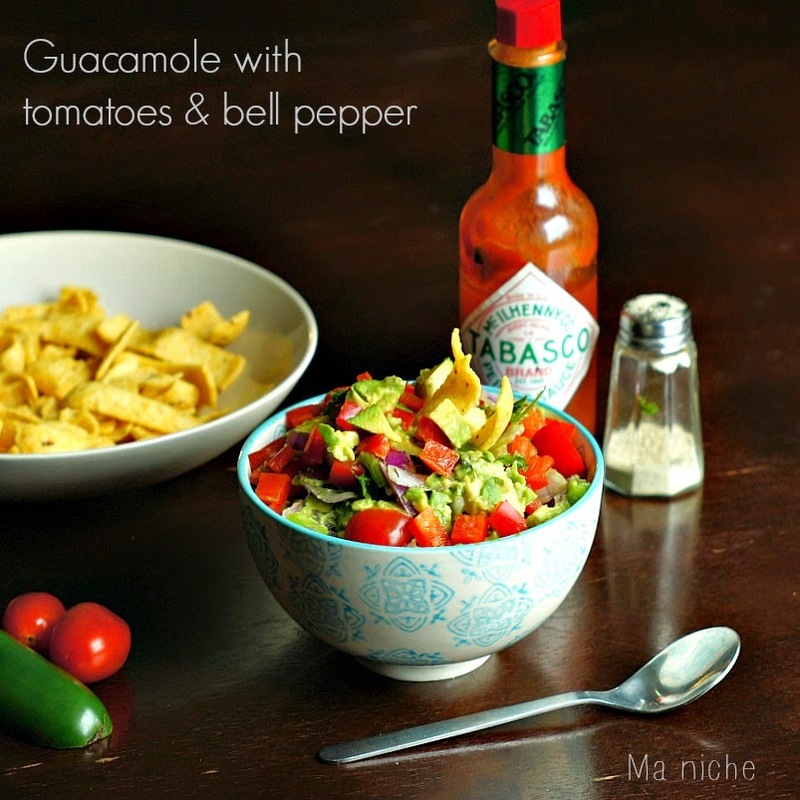 You can find the recipe for this guacamole here . For more such delicious recipes order your copies of Around my French Table and join the Doristas in this tasty adventure. Glad this was a hit with your crew! Looks perfect! Your chunky version looks delicious - no wonder the family wiped it clean. I guess if you are not a fish lover it has been a tough month with FFWD. Glad you got a break with a delicious recipe that was fun and easy to make. I don't have a mortar and pestle either. I just do a quick mix in the food processor. Your chunky version looks great! Your guacamole looks delicious!! So beautiful. And I'm happy you enjoyed it! This was a hit with my guests also. We enjoyed the chunky version. Love your chunky version! Glad it was a hit with your family! Lovely photos! Your chunky version looks FAB and glad your family loves it! Okay, Okay, no more fish for a few weeks. That first picture of yours looks so tasty that I almost feel like making another batch of guacamole. I prefer the chunky and was able to make it in a mortar and pestle so didn't have much of a mess. Nice job. June was very fishy, wasn't it? Luckily summer produce was on everyone's minds for July. The chunky version looks so pretty, but my partner would never eat an identifiable piece of jalapeño - I used my food processor instead!